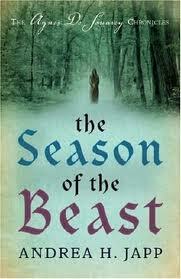 This is the first in a series of historical mysteries about a young widow in medieval France. It has been translated from French, but is nevertheless a beautiful book to read if you don’t mind confusing narratives. I confess I skimmed over the many subplots and historical references I wasn’t sure of, because the characters and places described in between were very interesting. In particular Agnes De Souarcy is a strong character partly because she is depicted in such glowing terms as a renaissance woman and partly because she remains vulnerable in spite of her ample ability and intelligence. What was fascinating also were the various social skills and hazards of France in 1304, which are so different to those we use today. The historicity of these I found convincing, and made this book a worthwhile read. I read it very quickly, and due to a cliffhanger ending will now need to read the second and perhaps third in the series.